No One Beats Our NJ Sewer Jetting Cleaning Prices! 100% clean sewer – Jetting services in NJ or hydro-jetting services is high pressure water jetting to clean all the build up sludge, tree roots and debris clogging your sewer line. Our hydro-jetter uses water at a pressure of 4000 pounds per square inch to scrub your entire sewer line to dislodge and remove any obstructions blocking the water flow or stuck to the walls of the sewer line. A hose is inserted into existing access points and blasts out water at very high pressure through the entire sewer pipe. Pressure is carefully regulated to ensure that all the blockages like sludge, tree roots and other debris is dislodged and carried through into the sewer. Sewer/drain cleaning jetting services with 100% clean pipe line guaranteed by local nj sewer repair service contractors/company. Sewer main lines on residential properties in New Jersey (NJ) can develop serious sewer pipe blockages and clogs that cannot be cleared by simple sewer snaking. This can be an insidious problem that slowly builds up in your sewer pipe lines over time, until eventually, you begin to notice problems with your household plumbing. When this happens, you’ll need professional sewer cleaning from a reputable New Jersey sewer repair company to fix the problem. At A1 Sewer & Drain, we use sophisticated sewer hydro jetting technologies, with heavy-duty professional sewer cleaning equipment that can be used in home sewer line, commercial sewer, and industrial sewer and drain pipe lines from manufacturers like Mongoose, O’Brien, and Spartan. In NJ sewer hydro jetting, which is more effective than auguring and other techniques, allows us to quickly break up and wash away even stubborn sewer clogs. Call #1 sewer cleaning and sewer jetting contractor in New Jersey, call us today. 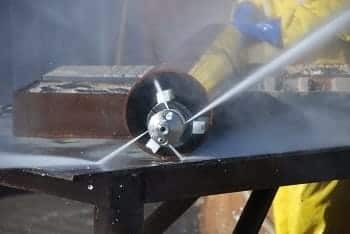 Sewer hydro jetting is a sewer cleaning method that uses streams of water released at very high pressures, rather like a pressure washer. The water acts as a powerful cutting tool to break up obstructions in your sewer line. After using fiber optic cameras to perform a sewer inspection and identify the problem, we can use sewer hydro jetting to clear out the offending material, restoring normal water flow from your New Jersey home’s sewer line pipes into the city’s municipal sewer systems. Materials washed down drains or flushed down toilets. Many products that seem okay to flush, like paper towels and tissues, don’t actually dissolve readily when exposed to water, making them a risk for plumbing clogs. Tree roots. The root systems of any large trees on your property can make their way into your sewer line, potentially clogging it. Hydro jetting for sewer cleaning can act like a powerful saw, cutting through even thick tree limbs and washing them safely away. Sludge and sediment buildup. Oils and food products that go down the drain can sometimes coat the walls of the sewer pipes and build up. Sometimes toilet paper and other items that are pushed down the drain can get caught on the build up and that can cause a slow drain or complete clogged drain. If you’ve noticed multiple clogged fixtures, sewage smells, and other signs of a sewer clog in your home, call A1 Sewer & Drain for fast, effective sewer cleaning and BEST PRICES for sewer or drain hydro jetting in New Jersey. Clogged drains can put your home at risk for flooding and serious damage to your sewer lines. Don’t wait to call an experienced NJ sewer service company. Emergency Sewer Cleaning in NJ 24/7! Call us today for 24-hour emergency sewer services, at 201-645-0888.